I've had liver flush tea available as one of my foundational Baseline of Health® formulas for almost 20 years now, ever since I was introduced to the work of Dr. John Christopher and spent some time lecturing with Dr. Richard Schulze. And in fact, the formula I use is much the same formula I learned from Richard--with the extremely important addition of Erva tostão. Nevertheless, despite it being a core Baseline of Health product, it turns out I never put together a detailed write up on the liver flush tea to clarify exactly what's in it, why those ingredients are included, and what the formula does as a whole. In this newsletter we rectify that omission. Dandelion root is a bitter herb that is highly effective as a blood cleanser that strains and filters toxins from the blood and has beneficial effects on both red blood cell count and hemoglobin count.1 Dandelion root is also a superb diuretic2 that improves the function of the pancreas, spleen, stomach, and kidneys without depleting potassium from the body. Cinnamon contains compounds called catechins which help ease nausea and make cinnamon beneficial when doing a liver detox. In addition, the plant's essential oil has been found to stimulate movement in the gastrointestinal tract--useful when trying to move waste along while detoxing. And cinnamon's pleasing scent stimulates saliva production, which aids in digestion. Fennel will help assist in the removal of mucus and phlegm from the lungs18 and help rid the intestinal tract of mucus--both useful benefits when detoxing. 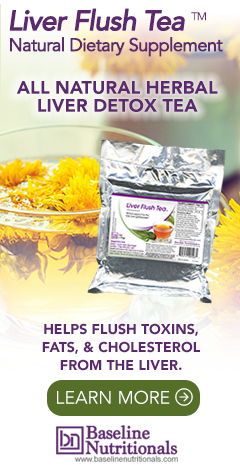 Its natural colon cleansing properties also have a cleansing effect on the gallbladder and liver. Juniper berries are a prime herb for eliminating congestion of the kidneys and for removing waste products from the system via the kidneys.23,24,25 They are, therefore, an important component of any detox regimen. Juniper berries are used to treat infections, especially within the urinary tract, bladder, kidneys, and prostate. Their antiseptic properties help remove waste and acidic toxins from the body, stimulating a fighting action against bacterial and yeast infections.26 Juniper berries also help increase the flow of digestive fluids, improving digestion, and eliminating gas and stomach cramping. As a diuretic, juniper berries eliminate excess water retention, thereby contributing to weight loss. Juniper berries' anti-inflammatory properties are ideal for relieving pain and inflammation related to rheumatism and arthritis. In addition, juniper berries are beneficial in reducing congestion, as well as treating asthma and colds. Juniper berries make an excellent antiseptic in conditions such as cystitis. But the essential oil present in this herb is quite stimulating to the kidney nephrons. Some texts warn that juniper oil may be a kidney irritant at higher doses, but there is no real evidence that this is the case, and the dosage in this formula is quite low. Nonetheless, people with serious kidney disease probably shouldn't take juniper. Contemporary herbalists primarily use juniper as a diuretic ("water pill") component of herbal formulas designed to treat bladder infections. The volatile oils of juniper reportedly increase the rate of kidney filtration, thereby increasing urine flow and perhaps helping to "wash out" offending bacteria. The volatile oils, particularly terpinen-4-ol, may cause an increase in urine volume. According to some sources, juniper increases urine volume without a loss of electrolytes such as potassium. It is recommended by the German Commission E for kidney ailments. Ginger has a long history of use in herbal medicine. In other newsletters, we have talked extensively about its effectiveness as a strong natural COX-2 inhibitor, thus functioning as an anti-inflammatory. This can be important when detoxing, as inflammation can sometimes become a problem as a result of a cleansing reaction. And maybe most importantly when detoxing, ginger root helps control temporary nausea,27 which makes it useful in morning sickness during pregnancy, as well as in intestinal activating and detoxing formulas…and in liver cleansing programs. And in fact, it was once used by sailors as an anti-seasickness tonic. The active ingredient in cloves is eugenol, a strong natural antipathogen. In fact, because of this capability, clove has been used historically as a food preservative. And in the same way clove keeps food fresh by ridding it of microorganisms, it also helps aid with upset stomach and diarrhea. The roots of Erva tostão have held an important place in herbal medicine in both Brazil and India for many years. G. L. Cruz, one of Brazil's leading medical herbalists, reports that Erva tostão is "a plant medicine of great importance, extraordinarily beneficial in the treatment of liver disorders. "36,37,38 It is employed in Brazilian herbal medicine both as a cholagogue to promote the flow of bile and as a diuretic. It is used for all types of liver disorders (including: jaundice, hepatitis, cirrhosis, anemia, flukes, detoxification, and chemical injury), gallbladder aches and stones, urinary tract disorders, cystitis, kidney disorders including stones, and nephritis. Erva tostão is called punarnava in India, where it has a long history of use by indigenous and tribal people and in Ayurvedic herbal medicine systems. There, the roots are employed as a diuretic, stomachic, laxative, and emmenagogue to increase menstrual flow. It is also used to address gonorrhea, internal inflammation of all kinds, dropsy, jaundice, menstrual problems, anemia, and liver, gallbladder, and kidney disorders. An important diuretic, parsley root helps aid in the removal of uric acid from the urinary tract and helps dissolve and expel gallstones and gravel -- and put a stop to their future formation. It also inhibits the secretion of histamine and is therefore useful in addressing hives and reducing other allergy symptoms. A decoction of parsley root can help with bloating and reduce weight by eliminating excess water gain. Note: the German Commission E, an advisory panel on herbal medicines, has approved parsley for use in the prevention and treatment of kidney stones. Historically, fenugreek has been used to treat both respiratory and stomach ailments. Specifically it is used for allergies, bronchitis, high cholesterol levels, diabetes, digestive ailments, emphysema, intestinal gas, gastrointestinal spasms, headaches, lung ailments, mucous congestion, and skin eruptions--all of which can be problems when detoxing. Fenugreek also decreases the glycemic incidence of food. In studies, the unique galactomannan ratio of galactose and mannose in fenugreek significantly reduces not only blood sugar levels,42 but also reduced the urinary sugar levels of participants by as much as 54%.43 And fenugreek seed decreases insulin response to food and helps maintain normal serum glucose levels by slowing down the absorption rate of carbohydrates, thereby lowering the insulin requirement, which can be useful when fasting on fresh juices. Finally, fenugreek seed has been shown to inhibit the absorption of fats. In fact, it is the steroidal saponins in fenugreek that account for many of its beneficial effects, particularly the inhibition of cholesterol absorption and synthesis. Although generally promoted as a tea to be used as part of a liver flush protocol, it also stands on its own and can be used independently of a formal liver detox. The tea provides numerous benefits. It helps cleanse the liver of fats and cholesterol. It protects the liver from various toxic substances and pathogens. It likewise purifies and protects the kidneys and urinary tract and works as a mild diuretic. It helps cleanse the blood. It is a carminative, which means it is soothing to the digestive tract--helping to overcome flatulence, bloating, and feelings of nausea. And it is a digestive stimulant. Add 1-2 tbsp of tea per 20 ounces of pure water. Let the tea sit in the water overnight. In the morning, bring to a boil and then quickly reduce the heat to a low simmer for 20 minutes. Throughout the day, you can dip into the tea with a ladle and pour it into a cup through a strainer. At the end of the day, you can either empty out the pot and start fresh or top off the pot at 20 oz with fresh water and add another tbsp of tea. Two days is probably as long as you want to go using the same tea before starting afresh. After two days, the taste can get pretty overpowering. When freshly brewed, because of the aromatic herbs in it, the tea has kind of a Christmassy smell. As for the taste, it's not bad at all--nothing like what you'd expect from a detox tea. Add a little honey or maple syrup, and it's actually quite pleasant. For use as part of a formal liver flush to help the detox process and ease nausea, consume two cups of the tea after the morning flush and a total of 5-8 cups throughout the day. For those who don't want to do the full liver flush, there is a slow and easy version that will give you 70 to 80 percent of the benefit without the difficulty. As part of your daily diet, just add one cup of raw, freshly grated beets mixed with enough olive oil and lemon juice to serve as a dressing. Do this for thirty days straight. Try to minimize consumption of fats throughout the rest of the day beyond the use of the olive oil in the beet salad. Daily use of the liver flush tea is also required. Using one bottle of a liver tincture during the 30 days is recommended, as is using one bottle of a blood support formula. And finally, the tea is mild enough that you can use 1-2 cups a day as a healthy, alternative, everyday beverage--particularly during the winter season--to replace coffee or black tea. It's good for your liver, good for your kidneys, and good for your digestion. This is interesting... might be good for us... maybe we should try it! D.
But where do I find the tea???? Jon did you ever try CVAC?? When I'm in the pod I think I might be in heaven??? I would love to try the liver flush tea! I'm currently on blood pressure medicine (which I'd like to wean off of) and wondering if it's ok to drink this tea while taking this med. I'm open to suggestions on how to lower the blood pressure and get off the bp meds. Please let me know. For obvious legal reasons, we cannot diagnose or prescribe for specific medical issues – merely provide information. With that in mind, yes the Liver Tea may moderately lower blood pressure because it works as a mild diuretic. But that means that you need to run it by your doctor to see if it conflicts in any way with the medication you are already taking. For more information on high blood pressure, check out http://www.jonbarron.org/article/arteries-and-veins. Where can I purchase the liver flush tea ? My husband is recovering from a serious onset of liver cirrhosis in 4/2011, has stopped drinking and is anxious to help his liver as much as possible now that he is no longer drinking. Please help ! Very interested... How do I get that tea ? I do a water only fast every Monday. Would this tea be a good accompaniment to the fast (as a replacement for some of the water)? Or, would this tea interfere with the cleansing effect of the fast? The fast begins after breakfast Monday morning and ends with breakfast Tuesday morning. Just in case the morning breakfast on Monday makes any difference. The tea would not interfere. Just drink it unsweetened, which is how Jon Barron drinks it. Would this tea be safe for someone who has advanced cirrhosis and hepatocellular carcinoma? Based on my experience with my long time fatty liver, herbal tea will help but nothing more. To cure your liver you have to do the strict diet and if it is cancerous you have go with 6 to 8 month on freshly squeezed juice. Good luck! Thank you for the article, I thoroughly enjoyed it! A couple of quick questions - is the tea safe to drink while pregnant and/or breastfeeding? Is this safe/beneficial for young children to consume? Also, I know a young child waiting on a liver transplant - would this tea be of benefit for him? Please how can I get this liver flush tea in Nigeria. I knw a friend that needs it urgently. It will really put a smile on her face. Jon Barron's version of the liver tea is available here: Http://Www.baselinenutritionals.com/Products/Liver-Flush-Tea.php. Please contact them about shipping availability, we don't sell products here. Thanks!